Curtain rod not included. Double rod may be needed for layering. Help keep the light out with the Mainstays Blackout Energy Efficient Grommet Curtain Panel. Available in a vibrant trend right color palette that will bring to life any room! Blackout curtains are energy efficient, noise reducing, light blocking and helps keep your home cooler in the summer and warmer in the winter. The darker the color the better the light blocking capabilities. A grommet top design makes it easy to hang and style your curtains. Sold individually - one curtain panel sold per package. Hang on a rod up to 1.5&quot; in diameter. Help keep the light out with the Mainstays Blackout Energy Efficient Grommet Curtain Panel. Available in a vibrant trend right color palette that will bring to life any room! 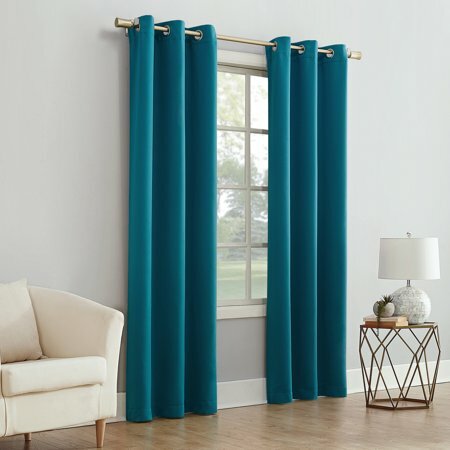 Blackout curtains are energy efficient, noise reducing, light blocking and helps keep your home cooler in the summer and warmer in the winter. The darker the color the better the light blocking capabilities. A grommet top design makes it easy to hang and style your curtains. Sold individually - one curtain panel sold per package. Hang on a rod up to 1.5" in diameter. Fabric Care Instructions: Machine wash cold on gentle cycle. Use non-chlorine bleach when needed. Tumble dry on low heat, using a cool iron as needed.